Many companies know how important inbound marketing is when it comes to staying relevant and competitive in today’s market. You need a marketing strategy that reflects the new way customers buy. Ready to get started with this methodology but not sure where to begin? Follow these nine steps. Having a solid understanding of inbound marketing—how it emerged, why it works, what results to expect—is the first step to getting started. If you don’t truly understand its value, you won’t be able to fully commit and stay motivated. It takes time to learn all the facets of this methodology. Fortunately, many resources are available online to educate you and your team. Before you start brainstorming new ideas and building a marketing strategy, it’s important to assess your current processes. What marketing assets do we have now? Are we using them to their full potential? How is our business getting found online? Who will be consuming the content you create? What are their personal demographics? In which industry do they work, and what are their roles? What does success mean for them? Where do they regularly go to stay informed (publications, social networks, etc.)? Your buyer persona research will inform much of your inbound marketing strategy. Once you understand who you’re selling to, you need to determine how they’re searching for information relevant to your business. Conduct keyword research and create a list of key terms to craft content around. Consider what exactly you want to achieve, and set clear marketing goals. Your inbound marketing strategy should also outline your content strategy, how you’ll nurture leads, and who is responsible for which tasks. A lot goes into inbound marketing. You’ll use a variety of tactics including blogging, webinars, social media, website development and design, search engine optimization (SEO), and more. To maximize efficiency, house all these pieces under the same roof and embrace automation. Disjointed tactics are simply ineffective. HubSpot is one tool that makes inbound marketers’ jobs infinitely easier. By consolidating all your processes in one platform, you save stress, time, and money. 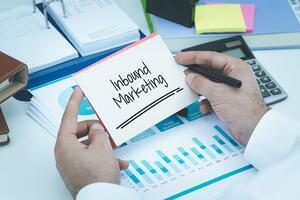 Your website is the hub of your inbound marketing strategy. This is where your prospects will land and where you’ll convert, close, and delight them over time. Create your website with your buyer personas and the user experience in mind. As a virtual front door to your company, it needs to reflect your brand and goals. Content is the lifeblood of inbound marketing. But high-quality content isn’t about promoting your company. Consumers today go online to find valuable information that will help them solve their problems. For every piece you publish—whether blogs, infographics, podcasts, or videos—focus on creating assets your website visitors will deem valuable. That’s how you’ll gain your customers’ trust and build brand authority. Creating content your audience wants to consume is one step. The next step is promoting that content to make sure your audience sees it! Use social media to publish your content on an ongoing basis. To get your content in front of the right people, find out where your buyer personas live online. Engage with your audience on these platforms—maintain an active presence by answering their questions and responding to their comments. To develop the most effective inbound marketing strategy, you need to measure the success of your efforts. Regularly analyze the impact of your campaigns to see what’s working and what’s not. Set benchmarks for success, communicate them to your team, and track metrics.